The 11th annual Asian Film Awards (AFA) took place at the Hong Kong Cultural Centre in Kowloon, Hong Kong on Tuesday, March 21, 2017. The awards ceremony is hosted every year by the Asian Film Awards Academy (AFAA), which consists of three major international film festivals in Asia, the Tokyo International Film Festival (TIFF), the Busan International Film Festival and the Hong Kong International Film Festival. Many nominees from Japan were on hand for the event, including director Koji FUKADA and actor Tadanobu ASANO from Harmonium, actress Atsuko MAEDA (The Mohican Comes Home) and actor Takara SAKUMOTO (Rage). 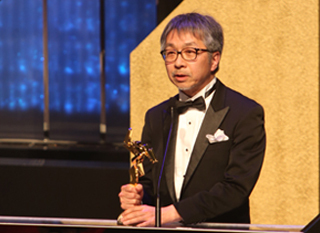 Tetsuo OHYA received the Best Visual Effects Award for his work in Shin Godzilla and Tadanobu ASANO won the Best Actor Award Award for his role in Harmonium, and expressed his happiness and thanks in English from the stage. The Best Film Award was given to I Am Not Madame Bovary, directed by FENG Xiaogang. Internationally acclaimed Hong Kong filmmaker TSUI Hark received the Lifetime Achievement Award. For the full winners list, please refer to below. The 11th AFA attracted participants from all over Asia, and was a great success. Thank you so much. It’s a great honor to come back here. Last year I got the Best Supporting Actor award and this year, it’s very special. I am very happy. I really want to say thank you to my director, Koji FUKADA. He helped me with a lot of things and he taught me many things and we had many discussions and made many rehearsals and we could build my role. That’s why I got this! Thank you, AFA. I am happy to get this award. VFX is work which requires many people’s ideas and wisdom. Tonight, I was awarded as a VFX producer, but at the same time I am here to represent many crew on the film. I really want to say thank you all on behalf of them.